How does the DfE and Ofsted measure Progress at Key Stage 1? What makes a good QLA? Why should KS1 progress be measured at all? 187. In judging achievement, inspectors will give most weight to pupils’ progress. They will take account of pupils’ starting points in terms of their prior attainment and age when evaluating progress. Within this, they will give most weight to the progress of pupils currently in the school, taking account of how this compares with the progress of recent cohorts, where there are any. Inspectors will consider the progress of pupils in all year groups, not just those who have taken or are about to take examinations or national tests. As part of pupils’ progress, inspectors will consider the growth in pupils’ security, breadth and depth of knowledge, understanding and skills. How has Ofsted measured progress in the past? In Ofsted’s 2017 Inspection Data Summary Report (“IDSR”), which was the document that Ofsted’s inspectors used before any inspection, Ofsted compared your school’s percentage of pupils achieving Key Stage 1 standards against various cohort in Early Years (EYFSP). The cohort types Ofsted used, in addition to all pupils, disadvantaged pupils, was “Emerging”, “Expected” and “Exceeding” pupils. 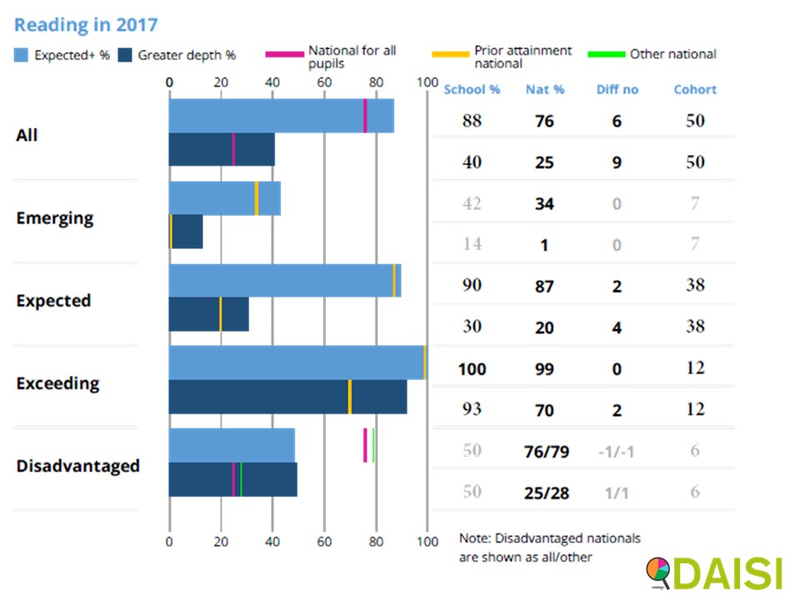 Ofsted’s inspectors then evaluated the difference for each of these three cohorts compared with the National average to show if your school is above/below National. Reading – Ofsted used the Reading ELG. Writing – Ofsted used the Writing ELG. Maths – Ofsted used both Maths ELGs, and took whichever was weaker. So if you had a 3 and a 2, then it used a 2 for Maths. So a pupil could be Emerging in Reading, Expected in Writing, and Exceeding in Maths at EYFSP, and therefore the EYFSP “Expected” pupils for Reading, Writing and Maths can be different. Is KS1 progress no longer measured this way? Ofsted no longer measures progress in Key Stage 1 this way. The EYFSP groups allow inspectors to reflect on a school’s approach to early literacy and numeracy, across early years, Year 1 and Year 2. This is not a value added measure, nor is it an accountability measure and should not be reported as an outcome. It is to inform inspectors and to prompt questions about the quality of teaching, learning and assessment. We will continue to review the content of the new IDSR in response to feedback, including the groups presented. How does Ofsted measure KS1 progress now? •the school’s own information, taking account of the quality and rigour of the assessment on which it is based. In our analysis of 50 Ofsted Inspection Reports from October 2018, we found that Ofsted inspectors were just using the overall figures, and the disadvantaged comparison. They were then using work in books and other evidence to view “progress” in Years 1 and 2. It should also be noted that, in the draft Ofsted Inspection Handbook which will be in place as of September 2019, Ofsted will not be taking account of school’s internal performance system. If you use the above link, you can get more than 3 hours of training for a very special price. Thank you for reading this article. If you have any comments, then please let us know. You get the best of DAISI when you sign up! !